Save the Date! 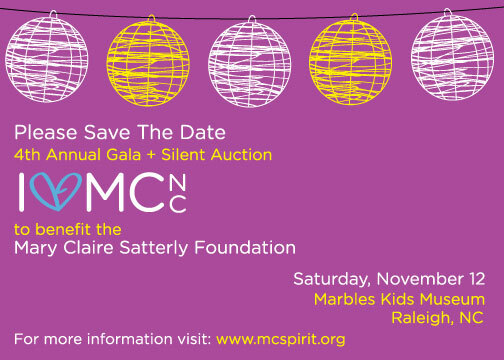 Nov 12th 2011- Raleigh, North Carolina MCNC Fall Gala and Silent Auction | "MCSpirit!" On November 12th, 2011, Mary Claire’s friends and family will gather to celebrate her “MCSpirit!” at the fourth annual “I ♥ MC” event, a Gala and Silent Auction, which will directly benefit the Mary Claire Satterly Pediatric Oncology Playroom at the UNC Lineberger Comprehensive Cancer Center, Leukemia Research Grants and the MCSF Digital Art Therapy program. After a successful event last year in New York, we look forward to bringing the event back home to North Carolina. Once again, the Marbles Kids Museum will serve as the backdrop for the “I ♥ MC-NC Gala and Silent Auction”. Given Mary Claire’s love for children and the Foundation’s goal of establishing the pediatric oncology playroom, there is no more fitting of a location to capture the spirit of the event. The evening will include cocktails, hors d’oeuvres, door prizes, gift bags and a silent auction while guests enjoy the entertainment by :DJ Joe Bunn. Donations to the Mary Claire Satterly Foundation though ticket purchase to the “I ♥ MC-NC Gala & Silent Auction” are tax deductible as a charitable contribution above the face value of your ticket and will directly benefit the Mary Claire Satterly Pediatric Oncology Playroom at the UNC Lineberger Cancer Center. Individual Tickets are $100. (Ticket donations are tax-deductible to the fullest extent of the law minus $70.00 per individual Ticket) . Please submit for Corporate Matching when available. Parking downtown on the night of the event will be FREE! We highly recommend parking in the Wilmington Station parking deck. The rear entrance of the parking deck is accessible from Blount Street, directly across from the Marbles Kids Museum. You can also enter from the front entrance on Wilmington Street. It will be safe to leave your car overnight, so please take a cab if needed – do not drink and drive! ***Message – Full name(s) and Mailing address you would like for your tickets to be reserved. Tickets WILL NOT be sold at the door, so please reserve your ticket now! We greatly appreicate your time and hope that you will consider sponsoring MC’s event this year and making a difference in the lives of children battling cancer. In-kind contributions to the Mary Claire Satterly Foundation through production donations to the “I ♥ MC-NC Gala and Silent Auction” are tax deductible as a charitable contribution and will directly benefit the Mary Claire Satterly Pediatric Oncology Playroom at the UNC Lineberger Cancer Center. Contributions are 100% tax deductible. The Gala is being held in Raleigh, NC at The Marbles Kids Museum located Downtown. The MCSF has a block of rooms being held at the Sheraton downtown for the evening of Nov. 12th, just roughly a mile away from the Museum. The link below will guide you to the site to reserve your room through the MCSF rate. modify, or cancel a reservation from September 7, 2011 to November 13, 2011. Also, only a short drive, cab, or shuttle from The Marbles Kids Museum is Crabtree Valley Mall area where additional hotel accommodations have been arranged. To make your reservations, select your preferred hotel please visit the reservation page via the link below. In addtion, there is also another block of rooms available for the weeekend (short drive or cab) at North Hills. Information and link to check out rate is below.